Hello and welcome to my Blog. Today’s card is for the Colour INKspiration Challenge CI34. The colours are Calypso Coral, Pool Party, Daffodil Delight and Basic Gray. I really like the colours together although I’m not sure if I would have put Daffodil Delight with this colour combination, but I think it works. I made my own mask, a window sheet die cut with Detailed Floral Thinlits. I then used some White Embossing Paste with my mask to create the background. The leaves are also die cut with the Detailed Floral Thinlits in Basic Gray. The flowers are die cut from Sweet Cake Framelits in Daffodil Delight and Calypso Coral. The sentiment is from Varied Vases. I hope you like today’s card. Welcome to another CASEing the Catty Sunday night Blog Hop. The 2017-2018 Annual Catalogue and the 2018 Occasions Catalogue have only three days before they end. This week we are CASEing our Favourite Retiring Project. You may have hopped over from Julia, thanks for continuing on with me. I’ve chosen a card from the Occasions Catalogue on page 44. I think you can tell which card I CASEd. I love the whole True Gentleman Suite but sadly it’s all retiring, except for the Tailored Tag Punch and the True Gentlemen Buttons. Bundle of Love Specialty DSP. Which is your Favourite? I’m leaning towards Bundle of Love. Next on tonight’s hop is the very talented Rebecca. Just click the next button to hop on over. We’d love you to show us your Favourite Retiring Project. Why not join in on this weeks Challenge? Hello and welcome to my blog. This week at CASEing the Catty we are CASEing our favourite Kit from any Catalogue. You may have hopped over from Sandra, thanks for continuing on with me. I’ve CASEd a card from the Hello Friend Heat Embossing Project Kit on page 16 and 17 of the Annual Catalogue. I’ve used the basic layout of this card but changed the colour scheme. 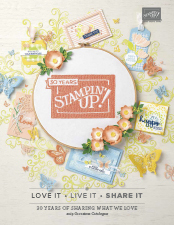 I’ve used the Amazing Congratulations stamp set on page 51 of the Occasions Catalogue. 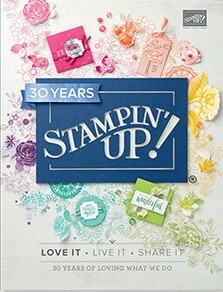 It’s a two step stamp set. I’ve stamped the outline “Congratulations” in basic black ink then I’ve heat embossed the other two stamps, one in Silver and one in Copper Embossing Powder giving the greeting a multi toned effect. I’ve used the small dots in this stamp set with versa mark to give the background effect. The DSP is from Petal Passion and I’ve used the Ticket Tear Border Punch on some Copper Foil for the border. Next on tonight’s hop is Kelly, I’m sure you’ll just love her project. Why not join our weekly Challenge? We’d love to see what you create.